If you are using the ferries to some of the remoter islands or anywhere requiring a walk or portage , towing trolleys are a great blessing. Based on our experiences this note is intended to help the choice. This has small wheels and costs £36. It goes at the tail of the kayak and tows well, although fully loaded it puts excessive strain on the arms and back. I have not tried it, but imagine it would be useless over soft beaches and rough ground. Not really recommended. A Decathlon trolley with medium size plastic wheels (about 8in in diameter) and a wide plastic “tyre”. This was used once lightly loaded on portages along the Crinan Canal. The vibrations on the gravel path shattered the three plastic spokes. Not recommended. 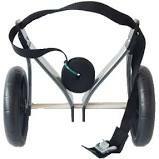 This trolley only costs £27, has many advantages but severe limitations. 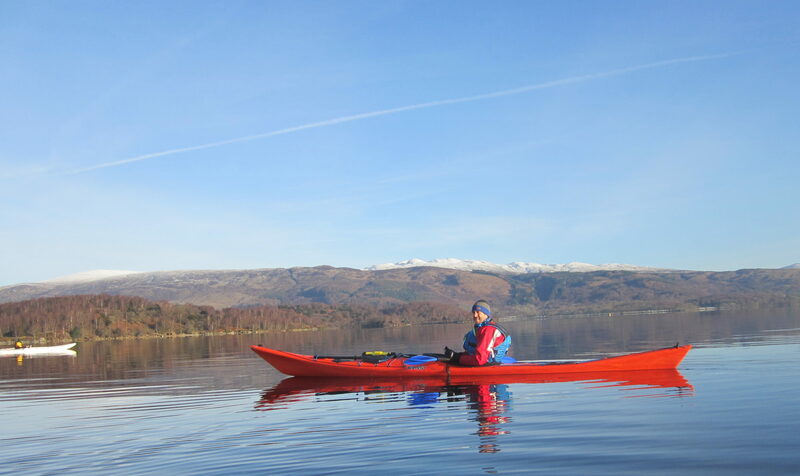 For carrying on the kayak the wheels detach and can be housed in the footwell of most kayaks. I simply strap the frame across the back but on a day trip it is small and light enough to go inside a hatch. 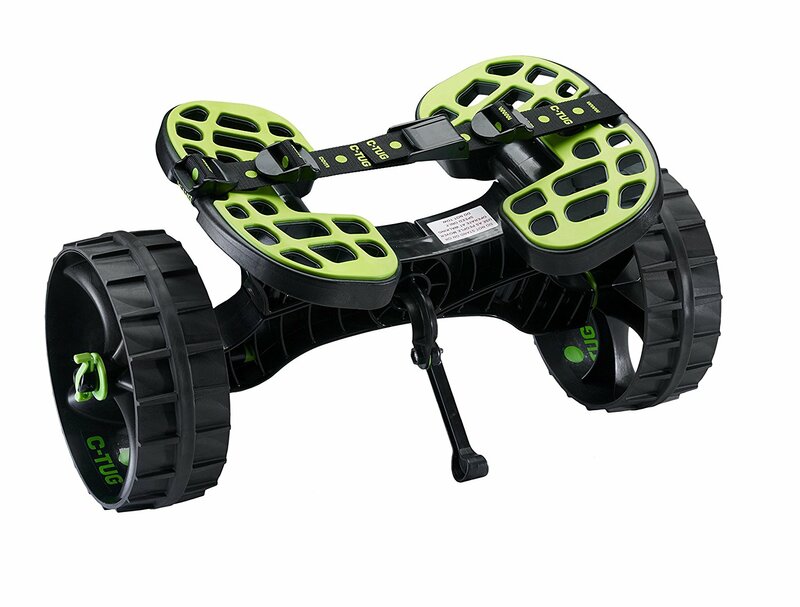 With semi-inflated tyres it can cope with beaches and rocky paths. There are no instructions on use but it comes with strapping for locating just behind the cockpit with the long strap attached to the front bar and around the cockpit coming. The elastic cord is fixed from the back bar over the kayak. In this position most weight is on the trolley. However with a fully loaded kayak the metal is simply not strong enough to withstand the forces generated on a rough track or “nobbly” beach and bends. Moving the trolley wheels back lightens the load but is much more difficult to attach and keep straight and puts more weight on the body of the person towing. Movement of the kayak on the trolley wears the fabric stripping keeping the bars from collapsing and in my case the strip wore right through. The simplicity of the design and the softness of the metal meant it was possible to repair/rebuild even after damage. There are a number of other makes of similar design such as Conwy, Andes, Riber, Casart and Duramax. Some have anodised frames (does that add strength?) and most claim to be capable of carrying loads of 100KG. One of the more expensive claims only 60KG. I have a heavy boat and carry a lot of gear but the total weight is still under 60KG, well within the Lomo maximum. However on a very rocky path or bumpy beach the weight is being “dropped” on to the frame repeatedly and clearly one of these “drops” was simply too much for the frame. 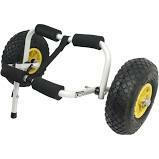 One alternative is the CTug trolley made of heavy duty plastic with solid plastic spoke wheels. It is heavier and much more expensive but may be more robust than the lighter aluminium/inflatable combination or the Decathlon copy. However the lack of any of the natural “springing” from soft inflatable tyres suggests equally it may not. It is also more difficult to transport on a kayak, or to repair if cracks do appear. My considered view is that the Lomo is hard to beat in terms of cost and utility but must be handled with care. On very rough ground this means getting some of the load out of the boat and on to the body and moving the position of the trolley further back on the kayak.